Well at least it will be a better ending then the Premier League’s final week promised to be. Serie A still has one week left and two times competing for the league title. Inter has the good fortune of an away match at relegation bound Siena; whereas Roma will be on the road facing a middle of the pack Chievo Verona club. With a two point lead over their Coppa de Italia’s opponents, Inter should have the double secured by the end of the weekend. The real fascinating story in my opinion isn’t the Siena-Inter match (Inter should easily win), but Sampdoria and Palermo’s race for the final Champions League spot. Sampdoria holds the two point advantage over Palermo, but Palermo has the easier draw with a match against relegation bound Atalanta. Sampdoria has the home field advantage in a match with Napoli who secured a sixth place finish and a Europa Cup berth next year. But as far as relegation goes there will be no last gasp for the top tier for Atalanta, Siena, and Livorno. 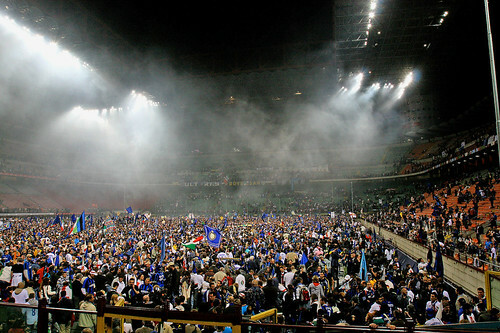 the three squads will be going back to Serie B next year. But the top four still has some questions left unanswered and of course first place has yet to be decided. The last week should offer several teams relief for the season finally being over (AC Milan, Fiorentina, Udinese, and Juventus), but for one team it will likely mean something special. A double is on the way in Inter Milan and the treble seems like a real possibility.